An early Billings, Montana photographer, Alfred Baumgartner had a studio on Minnesota Avenue which opened in 1906 and closed just a few years later. 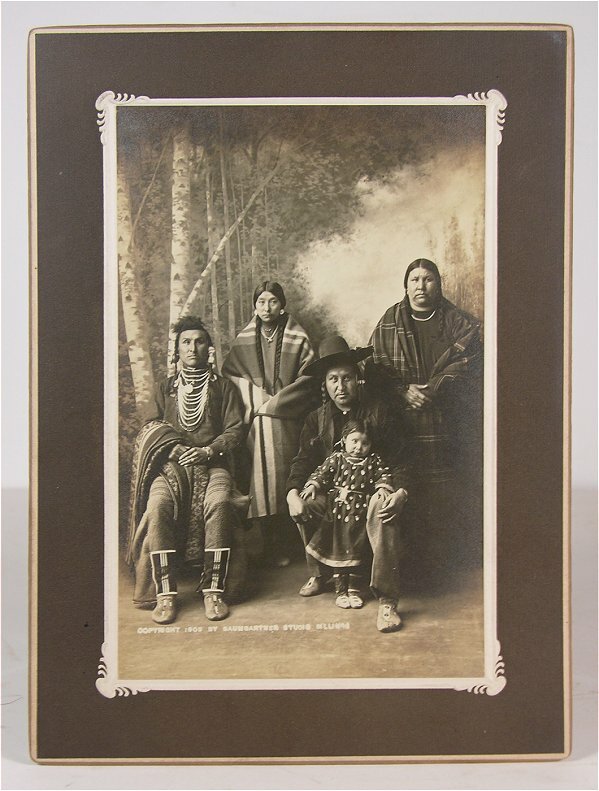 Little is known of his work except that he was certainly a true Western Photographer – had a “cowgirl” in his employ at the studio and most of his surviving works are in studio portraits of local Billings, Montana residents. 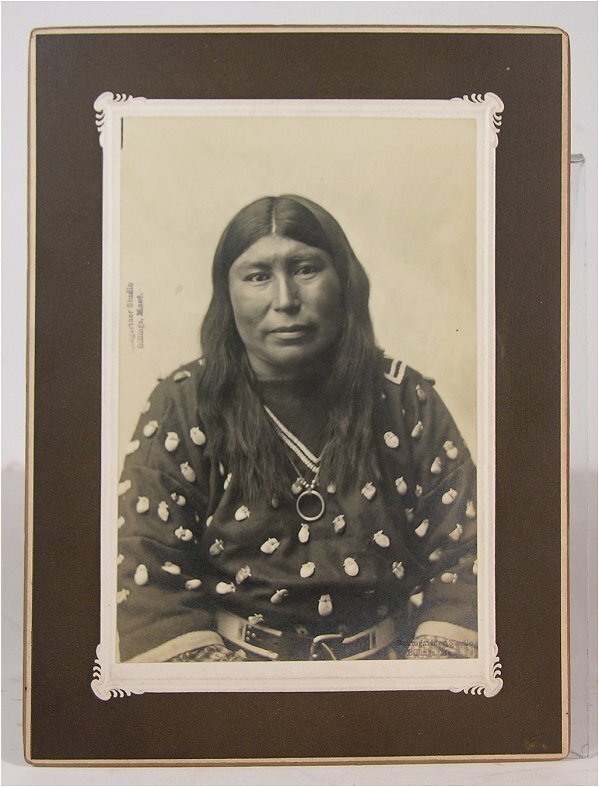 We recently purchased a small collection of simply fantastic and stunningly beautiful, Art Photo style portraits of Native American Crow who lived on the expansive Crow Indian Reservation south of Billings, that were taken and copyrighted in 1906 by Alfred Baumgartner. As far as we can tell Baumgartner, never published this or any of the Crow Images in this wonderful collection as we can find only a single example of a Native American Photograph by Baumgartner in any museum or library collection (that photograph is of Crow Chief Plenty Coups and is held in the collection of the Yellowstone Western Heritage Center- image can be found here). We believe this beautiful Photograph may be the only known example or at the very least exceptionally rare. Each Photograph in this collection is very much in the style of Carl Moon with a soft, warm “feel” to the Image and a respectful treatment of the subject, and most features a wonderfully appropriate and beautiful painted backdrop and the high quality and stunning beautiful, embossed card mount that complete the artistic presentation. There is text in a number of the negatives, or stamped on the recto, that reads “Baumgartner Studio, Billings, Mont.”. 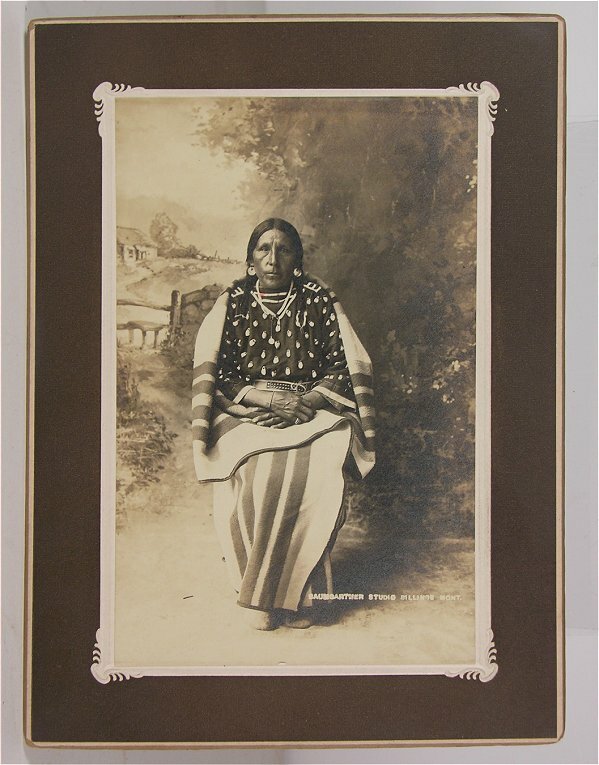 Studio full length Photographic seated portrait of an unidentified Crow Woman dressed in a beautiful, elk tooth tunic and wearing a multi-strand necklace and agency blanket. 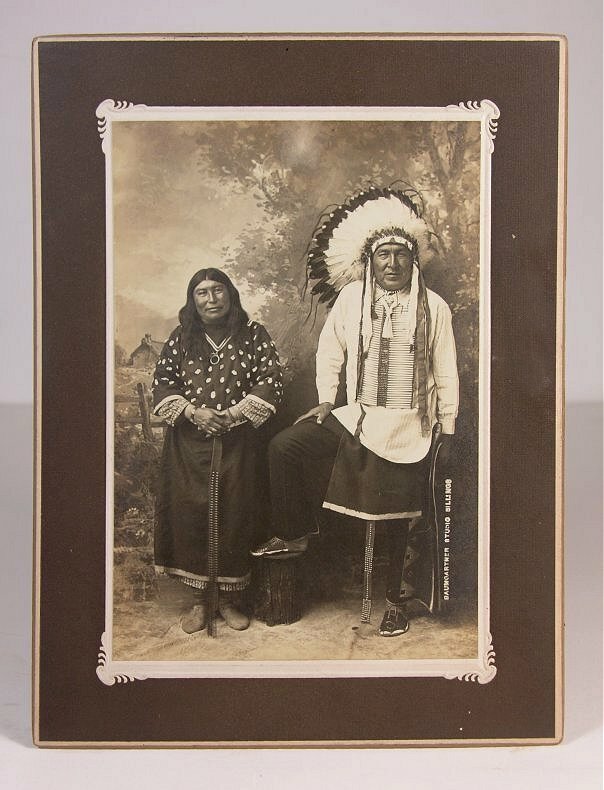 This Photograph is a full figure, studio portrait of the Plenty Coups and his wife Strikes the Iron dressed in a combination of traditional and western garb with Plenty Coups wearing his full eagle feather war bonnet and a pipe bone breastplate. 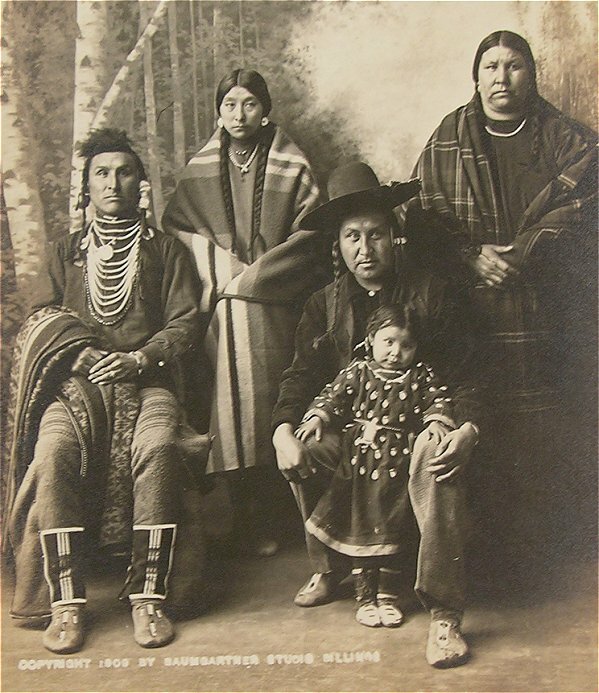 The last traditional Chief of the Crow Nation, Plenty Coups was a visionary that led his people from the ‘Buffalo Days’ into the 20th century. He was an accomplished statesman and ambassador well known by several US Presidents and foreign leaders. Chief Plenty Coups best illustrated the close bond between the US and Crow Nation when, in 1921, he offered his war bonnet and coups sticks at the dedication of the Tomb of the Unknown Soldier. In his speech, he promised the allegiance of Crow warriors to fight any enemy of the United States. His promise has been upheld countless times in wars or armed conflicts since that gathering. The Chief was a leader by example – he was a productive farmer and stockman, expert steward of his 1885 allotment, and a supporter of education. In 1928 Plenty Coups and his wife, Strikes the Iron, willed their home and land as a place for all cultures to come together in a cooperative nature. Their homestead is now Montana’s Chief Plenty Coups State Park. The Chief did not dedicate this location to glorify himself or his deeds, but to honor the culture of the Crow Nation and to bring people together. 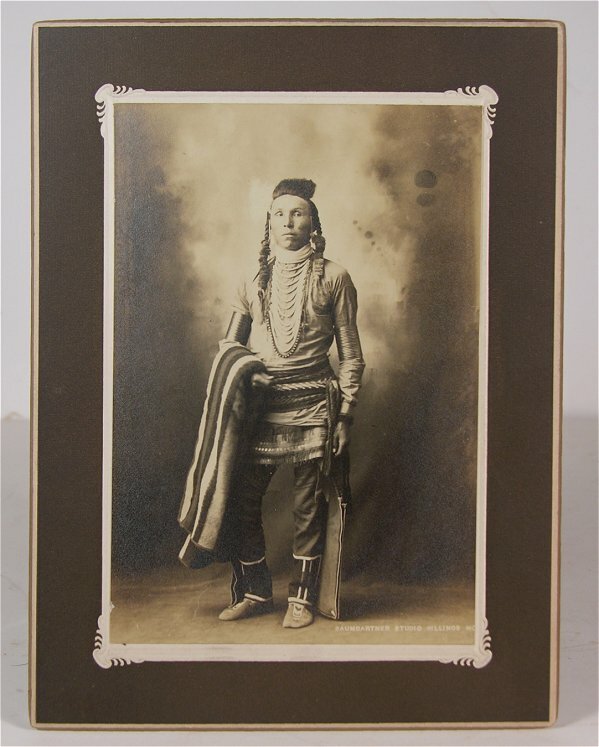 This entry was posted in 19th Century, Native American, Native American History, Past Auction, Photography and tagged 19th century, antique photographs, antique photography, Crow Indian, Crow Nation, Native American. Bookmark the permalink.